Recycling is a way to take trash and turn it into new products. 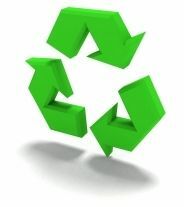 There are a number of different recycling processes that allow materials to be used more than once. All sorts of materials can be recycled. Some of the most common processes in use today involve recycling plastic, glass, metals, paper, electronics, and textiles. Typical used items made of these materials include soda cans, plastic milk cartons, newspapers, old computers, and cardboard boxes. Recycling is actually a complicated process and is different for each type of material. Aluminum cans - Aluminum cans were one of the first items to be heavily recycled. The process isn't quite as complicated as it is for some other materials. The cans are first shredded and then melted. From there, the aluminum can be used to make new cans and other aluminum items. Plastic bottles - There are a lot of types of plastics and each type is made from a different combination of chemicals. As a result, plastic bottles are first sorted into their various chemical types. Then they are cleaned to get rid of any leftover food or other waste. Next, the bottles are crushed or shredded into fine plastic chips. Then the chips can be melted down to create new plastic or turned into a fiber used for making carpets or clothing. Paper - Paper starts its recycling process by being mixed with water and other chemicals to break it down. It then gets shredded and heated up. This process eventually turns the paper into a pulp or slurry. The pulp gets strained in order to remove any glues or plastics. After that, it gets cleaned and bleached to remove any left over inks or dyes. Now the pulp is ready to be made into new paper. Computers and Batteries - Computers and batteries are usually recycled in order to remove harmful chemicals as well as to recover, or salvage, some valuable materials such as gold from electronics boards. Collecting recyclable materials, like aluminum cans and plastic bottles. Processing the old materials and making new items. 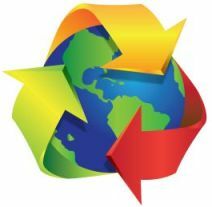 Landfills - Recycling materials means less trash and saves space in dumps and landfills. Resources - When we use materials again, this means we can take fewer resources from the Earth. Pollution - In general, recycling materials can produce less pollution helping to keep our environment clean. Be sure to recycle everything you can in your house and school. There is almost always a "recycle" trash can around. Be sure to drop your used aluminum cans and plastic bottles there. At home, be sure to put paper items like the newspaper, cereal boxes, and homework pages into the recycle bin. Plastics are usually marked with an identification code that shows a recycling symbol and a number from 1 to 7. This indicates the type of chemicals, or polymer, used in making the plastic. Used paper can be recycled around seven times. After this the fibers get too short and are filtered out by the recycling process. Some waste material is turned into electricity energy by burning it in modern incinerators. Glass is one of the best recycling materials. Clear glass can be recycled over and over again. 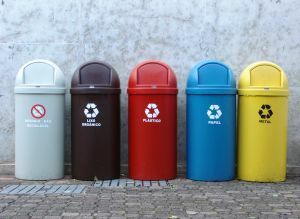 In 2009, the United States recycled around 1/3 of all its waste. Around 7 million tons of metals were recycled.